Based on a popular ESPN Magazine article—a finalist for a National Magazine Award and chosen by Dave Eggers for inclusion in Best American Nonrequired Reading 2011—the astonishing true story of Phiona Mutesi, a teenager from the slums of Kampala, Uganda, who becomes an international chess champion. 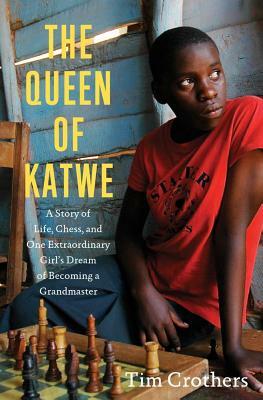 Based on a popular ESPN magazine article selected by Dave Eggers for The Best American Nonrequired Reading and a finalist for a National Magazine Award, the inspiring true story of Phiona Mutesi, a teenage chess prodigy from the slums of Kampala, Uganda. PHIONA MUTESI sleeps in a decrepit shack with her mother and three siblings and struggles to find a single meal each day. Phiona has been out of school most of her life because her mother cannot afford it, so she is only now learning to read and write. Phiona Mutesi is also one of the best chess players in the world. One day in 2005, while searching for food, nine-year-old Phiona followed her brother to a dusty veranda where she met Robert Katende, who had also grown up in the Kampala slums. Katende, a war refugee turned missionary, had an improbable dream: to empower kids through chess—a game so foreign there is no word for it in their native language. Laying a chessboard in the dirt of the Katwe slum, Robert painstakingly taught the game each day. When he left at night, slum kids played on with bottlecaps on scraps of cardboard. At first they came for a free bowl of porridge, but many grew to love chess, a game that—like their daily lives—means persevering against great obstacles. Of these kids, one stood out as an immense talent: Phiona. By the age of eleven Phiona was her country’s junior champion and at fifteen, the national champion. In September 2010, she traveled to Siberia, a rare journey out of Katwe, to compete in the Chess Olympiad, the world’s most prestigious team-chess event. Phiona’s dream is to one day become a Grandmaster, the most elite title in chess. But to reach that goal, she must grapple with everyday life in one of the world’s most unstable countries, a place where girls are taught to be mothers, not dreamers, and the threats of AIDS, kidnapping, and starvation loom over the people. Like Katherine Boo’s Behind the Beautiful Forevers and Gayle Tzemach Lemmon’s The Dressmaker of Khair Khana, The Queen of Katwe is an intimate and heartrending portrait of human life on the poor fringes of the twenty-first century. Tim Crothers is a former senior writer at Sports Illustrated. He is the author of The Queen of Katwe: One Girl’s Triumphant Path to Becoming a Chess Champion and The Man Watching, the biography of University of North Carolina women’s soccer coach Anson Dorrance, and coauthor of Hard Work, the autobiography of UNC basketball coach Roy Williams. He lives in Chapel Hill, North Carolina, with his wife and two children. "A must-read for all who dare to dream." "The Queen of Katwe is an extraordinary account of one young woman’s exceptional achievement. It is also a lament for this world in which only a tiny number of incredibly fortunate and exceptionally determined children have any chance of escaping the dehumanizing poverty that prevails in Katwe and places like it." "The Queen of Katwe Tim Crothers gives us an inspiring and heart-wrenching story." "An inspirational profile of an amazing chess player from one of the world's worst slums." "Phiona’s story ... will break readers’ hearts. Phiona’s perseverance, courage, faith, and hope will have the very same readers rooting for her success." "Part of Crothers's achievement is his presentation of the terrible circumstances millions of people battle every day to sustain themselves and feed their families, nearly all of them lacking the bright, improbable possibility provided by Mutesi." "TimCrothers powerfully captures the crushing poverty in which Mutesi and herfamily still live." "Phiona’s story transcends the limitations of the chessboard--her life not confined to the miniature pieces that her hand glides from her side of the board to attack her opponent’s king. No, Phiona succeeding at chess, like the fight to become great athletes for so many impoverished people around the world, has been a game for her life." "Wonderful.... A story of resilience and creativity in the midst of immense need." "Crothers provides in-depth portraits of the people and institutions around Mutesi."